Steven Beissinger and John Harte. 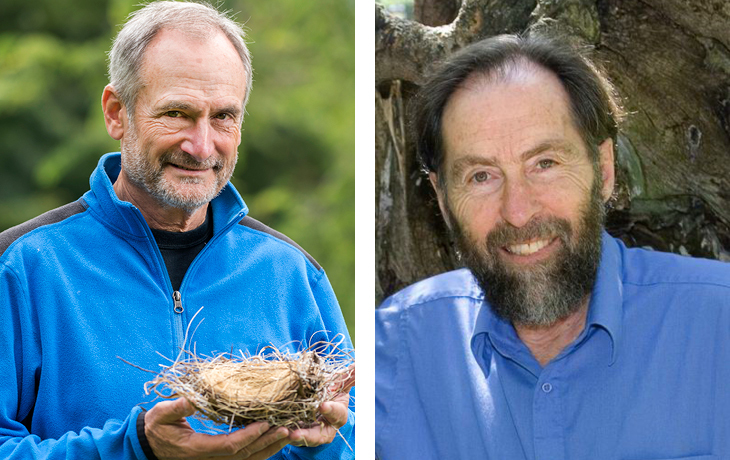 Congratulations to professors Steven Beissinger and John Harte, who have been named 2019 Fellows of the Ecological Society of America (ESA)! Beissinger is elected for his innovative research that quantifies the effects of a century of contemporary climate and land-use change on birds and mammals; that integrates field studies, analytical methods, and models for managing threatened species; and that advances understanding of the ecology and behavior of birds. Harte is elected for his foundational leadership on early work on climate change and education of the ecological crisis to come, for pioneering work on feedbacks and synergies among global change drivers, and for development of the maximum entropy theory of ecology. ERG alumnus Scott Saleska, PhD '98, was also elected as a fellow. Now a professor at the University of Arizona, Saleska was elected for his seminal contributions to global ecology and earth science, including pioneering novel methodologies that have revolutionized understanding of the drivers of productivity and forest dynamics in the Amazon and of microbial dynamics in thawing permafrost systems, and for contributions to international educational infrastructure and national environmental policy. Fellows are ESA members who have made outstanding contributions to a wide range of fields served by ESA, including, but not restricted to those that advance or apply ecological knowledge in academics, government, non-profit organizations and the broader society. They are elected for life. View the full list of 2019 fellows at the ESA website.